A finished mold of a patient’s teeth as Orthodontist Harold Slutsky uses 3-D technology to make braces from start to finish. Remember when you got braces in middle school and had to sit in the orthodontist's office with a tray filled with goo to make a negative impression of your teeth, just so you could get a mouth full of metal? For some patients, those days may be over. Now, clear plastic aligners that move teeth without conspicuous wires or brackets can be made in less time and for less cost using 3-D printers and scanners that have grown affordable enough to be installed in orthodontists' offices. The advance in technology has also opened the door for direct-to-consumer companies to enter the market. But orthodontists caution against going that route, and not just because it's cutting into their business. At orthodontist Harold Slutsky's Mayfair office, technicians use an intra-oral scanner – a large, wand-like device — inserted into the patient's mouth to get a 3-D image of the teeth. The image is sent to a computer, where Slutsky uses specialized software to make tiny adjustments in the image, with the goal of gradually moving crooked teeth into proper alignment. Then a 3-D printer creates a series of plastic models. Clear aligners the patient will wear are then made, using a sheet of dental-grade plastic that is heated and formed around the models. With a little trimming and polishing, the braces can be ready by the next morning, said Slutsky, who is among the first in the area to use this process. He said his patients are "blown away" by the technology. And, because it's less expensive to keep the process in-house rather than using an outside lab, the patient's costs can be "significantly less," he said. The total cost depends on the severity of the patient's problem and how long it will need to be treated, said Slutsky, who wouldn't quote prices because they vary widely. 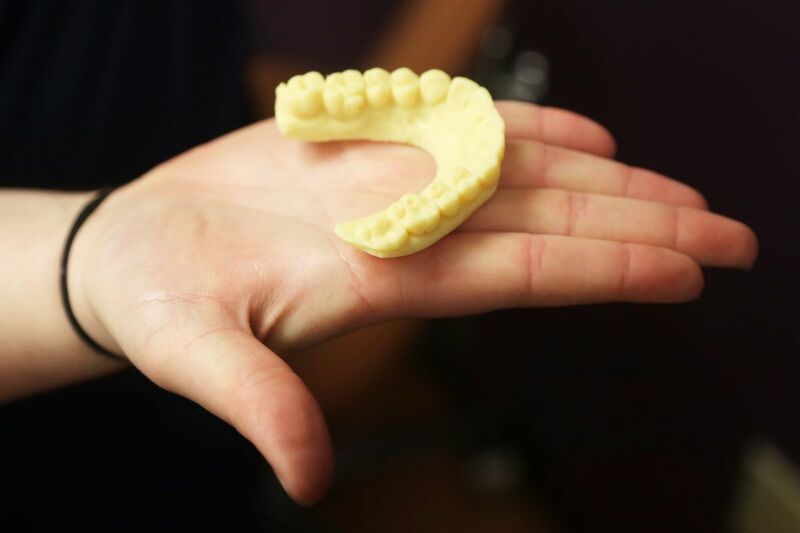 "I think every orthodontist will have a 3-D scanner and printer," he said. "It's a matter of time." Not every patient should expect to be wearing 3-D clear aligners, said Slutsky, who also teaches at Temple University's Kornberg School of Dentistry. Complicated conditions are better treated with conventional braces. For instance, the clear plastic aligners won't replace a palate expander, which actually moves bones. As with all braces, users must be diligent about brushing their teeth after eating or drinking anything beyond water. But unlike conventional braces, plastic aligners can be removed by patients, and should be for eating and flossing. Unless they are worn as directed, they won't work, Slutsky said. A conventional photo, top and a digital scan, bottom, of the teeth of a patient of orthodontist Harold Slutsky’s at the beginning of treatment. At Temple, orthodontic residents are learning to create clear aligners. The school has two 3-D printers and has just ordered new scanners and software. "The printed results are excellent and sometimes better than impression techniques," said Jeffrey H. Godel, chair of Temple's graduate program and department of orthodontics. The orthodontist now has more control over the set-up and process, he said. "I can sit down with the software programs and I can get instantaneous results," Godel said. "I don't have to wait for a technician someplace else." Patients get a series of aligners as their teeth gradually shift toward their ultimate position. The process may appear straightforward, but Godel and Slutsky both stressed that realigning teeth can be complicated, sometimes because of underlying problems. A lot of things can go wrong with unsupervised treatment, including problems with gums, destruction of the roots and, in severe cases, loss of teeth, Godel said. "All you need to do is put force on a tooth and it will move," he said. "It needs to be monitored by a dental professional and, ideally, an orthodontist." In the Philadelphia area, the cost of the clear braces that include the exams, X-rays and scans, and diagnostic plan, can range from about $5,500 to $7,500, depending on the severity of the case and the location of the orthodontist's office. While the technology is becoming commonplace at orthodontic practices, the ease with which the plastic aligners are made has also spawned direct-to-consumer businesses. Dental assistant Serena Kohlepp shows how the teeth are scanned on orthodontist Harold Slutsky, who uses 3-D technology to make braces from start to finish. In 2017, Align Technology, makers of Invisalign's clear aligners, was a darling of Wall Street, driven largely by growth from young adults in the United States and business in China. Though Invisalign is not sold directly to consumers, Align holds a 19 percent interest in SmileDirectClub, which does. Both companies declined to be interviewed. On its website, SmileDirectClub states it offers low-cost braces "without the hassle of in-person monthly visits." Customers start with an at-home impression kit or visit a "SmileShop" for a scan done by "registered dental assistants, dental hygienists or home health aids." From there, a state-licensed, board-certified orthodontist or general dentist reviews the information, creates the plan for the aligners, and follows the case remotely, the website says. The cost is estimated to be about $2,000. Some orthodontists insist that no one should try such services. Others are a little more pragmatic. "If better is better than nothing, these products are worth a look," Detroit orthodontist Jamie Reynolds wrote last year in the New York Daily News. "If you have noticeably crooked or spaced teeth, and seek perfection — or anywhere close — you are best to contact your local orthodontist and consider comprehensive products like braces or Invisalign." Start-ups, such as the Philadelphia-based Orthly, also are elbowing their way into the teeth-straightening market. In 2016, Orthly's founder and CEO Patrick Lee was a freshman at Duke University when a visit to an orthodontist for a consult got him wondering why the clear aligners cost so much. He took a leave from school and teamed up with Wharton student Daniel Hanover, now Orthly's chief technology officer. Instead of having an orthodontist follow the patient throughout the process, the pair developed an app that sends patients to a dentist, who conducts the in-person exam. A licensed orthodontist, working remotely, oversees the process, he said. Their aligners arrive at the patients' home four weeks after payment by credit card. But Orthly is working with just one dentist in Philadelphia and isn't accepting new patients until they've improved the app, Lee said. The American Association of Orthodontists, which represents 19,000 orthodontists in the U.S. and abroad, is fighting efforts to sell braces directly to consumers. Kevin Dillard, general counsel for AAO, said the organization has filed complaints with 36 state dental boards – including New Jersey, but not yet Pennsylvania and Delaware – alleging SmileDirectClub is practicing dentistry illegally. "From a public health perspective, the practice of orthodonture is a complex medical-biological process," Dillard said. "It is not a product." The group has also issued a warning to consumers: "Moving teeth without a thorough examination of the overall health of the teeth and gums could result in the permanent loss of teeth, which may result in expensive and lifelong dental problems," they stated on their website. A plastic model made using uses 3-D technology is shown with clear plastic used to make the aligner. Such cautions didn't stop Amos Dudley, now 26, who was a student at New Jersey Institute of Technology in 2016 when he decided to make his own braces. Dudley had braces in elementary school but admitted he didn't wear his retainer and a few of his front teeth were slightly out of position. Years later, with NJIT's scanners and 3-D printers at this disposal, Dudley consulted orthodontic literature, found some open source software on the internet, spent $60 for supplies, and made his own clear aligners. Seven months later, he had "pretty much perfect" teeth, he said. Even so, Dudley does not recommend the do-it-yourself route. Unless you happen to have access and know-how, the equipment is costly and the process was "not at all convenient," he said. But, there was one added benefit for Dudley: It helped him get a job. After his braces project hit the news, Massachusetts-based FormLabs hired him. "We develop 3-D printing materials and hardware that lets orthodontists do this exact thing," Dudley said.